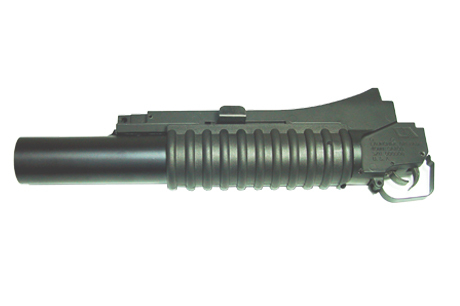 The Classic Army M203 is a replica of the famed M203 grenade launcher used by the U.S. armed forces all over the world. It attaches to the barrel of the M16 requiring the removal of the bottom hand guard. This is a solid unit, just like everything Classic Army Makes, almost everything is made of metal, except the hand guard which is plastic for a comfortable grip. For best results a one piece barrel should be installed for a solid mounting point. There is no better way to add menace and realism to your M4/M16 than to add the Classic Army M203 BB Shower Grenade Launcher. The CA Military Style M203 Mount for CA M15 A4 is required to mount this unit to the gun. this m203 is good i had one for a bout a 1/2 a year and they are fun to use. When you fire it, it make a sound like a firecracker going off. and a wide spread for all of the shells. This can work on a ris if it has a long barrel. you will need a shell, the best is mad bull there shells are good. the lower part is abs plastic. You also will need mounts airsoftextreme.com. very fun to use. Got a used RIS one and shot 3 friends at one time. This product was added to our catalog on Sunday 03 April, 2005.